A number of readers have asked me about our ongoing work on using data for careers guidance. I am happy to say that after our initial ‘proof of process’ or prototype project undertaken for the UK Commission for Employment and Skills (UKCES), we have been awarded a new contract as part of a consortium to develop a database and open APi. The project is called LMI4All and we will work with colleagues from the University of Warwick and Raycom. The database will draw on various sources of labour market data including the Office of National Statistics (ONS) Labour Force Survey (LFS) and the Annual survey of Hours and Earnings (ASHE). Although we will be developing some sample clients and will be organising a hackday and a modding day with external developers, it is hoped that the availability of an open API will encourage other organisations and developers to design and develop their own apps. Despite the support for open data at a policy level in the UK and the launch of a series of measures to support the development of an open data community, projects such as this face a number of barriers. In the coming weeks, I will write a short series of articles looking at some of these issues. In the meantime, here is an extract from the UKCES Briefing Paper about the project. You can download the full press release (PDF) at the bottom of this post. And if you would like to be informed about progress with the project, or better still are interested in being involved as a tester or early adapter, please get in touch. 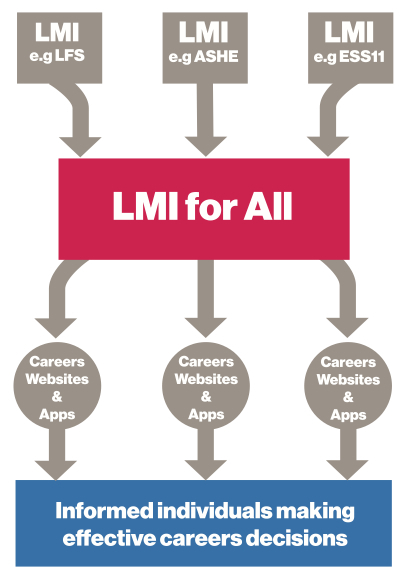 What is LMI for All? LMI for All is a data tool that the UK Commission for Employment and Skills is developing to bring together existing sources of labour market information (LMI) that can inform people’s decisions about their careers. The outcome won’t be a new website for individuals to access but a tool that seeks to make the data freely available and to encourage open use by applications and websites which can bring the data to life for varying audiences. At heart this is an open data project, which will support the wider government agenda to encourage use and re-use of government data sets. The data tool will put people in touch with some of the most robust LMI from our national surveys/sources therefore providing a common and consistent baseline for people to use alongside wider intelligence. The data tool will have an access layer which will include guidance for developers about what the different data sources mean and how they can be used without compromising quality or confidentiality. This will help ensure that data is used appropriately and encourage the use of data in a form that suits a non-technical audience. What LMI sources will be included? The data tool will include LMI that can answer the questions people commonly ask when thinking about their careers, including ‘what do people get paid?’ and ‘what type of person does that job?’. It will include data about characteristics of people who work in different occupations, what qualifications they have, how much they get paid, and allow people to make comparisons across different jobs. The first release of the data tool will include information from the Labour Force Survey and the Annual Survey of Hours and Earnings. We will be consulting with other organisations that own data during the project to extend the range of LMI available through the data tool. This entry was posted on Wednesday, November 21st, 2012 at 18:25	and is filed under Career Guidance, careers, Data, Open Data, Open Educational Resources, Wales Wide Web. You can follow any responses to this entry through the RSS 2.0 feed. Both comments and pings are currently closed.